I’m so psyched that I had the chance to sit down with my good friend Ruby Warrington and talk about her book, Material Girl, Mystical World! I met Ruby when she was living in London and writing for the UK Sunday Times Style magazine. She had begun exploring her spiritual side more and more and soon became a full-on Spirit Junkie. In 2013 she launched her awesome website, The Numinous. Ruby is an astrology guru who will blast open your understanding of the stars, tarot and all things mystical. I love that she is deeply spiritual without sacrificing another big part of herself, which is her love for fashion and style. You don’t have to give up worldly pleasures to live a spiritual life. 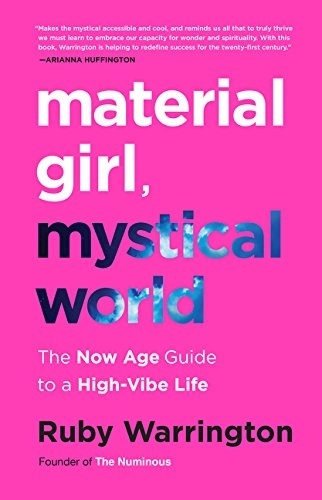 Recently Ruby published her first book, Material Girl, Mystical World. I couldn’t put it down because she has such a warm, inspiring, honest and funny voice. I have no doubt that every Spirit Junkie reading this will relate to many parts of Ruby’s story and spiritual journey! I also learned in this interview that I was the first person who told Ruby to write a book. I knew she had one in her…. Watch our talk below and go buy Ruby Warrington’s amazing book. Thank you so much to you all for sharing this wonderful perspective! Looking forward gleaning some insight and probable applications for the Journey! Thanks again!! I’m so pleased it served you, Crystal! Can’t wait to read her book, if it’s anything like yours, Gabby, it’s going to be great! I resonate deeply with you two <3 I love, love, love the expression that healing is the new night life, this is my dream to make going out in the night about dancing, connection and showing up authentically, this is all coming together and the energy is supporting the shift I can feel. Thank you so much, Gabby for having Ruby as a guest on your show. I am excited to learn about her work and to read her book. It sounds so inspiring. Congrats Ruby on your book! A wonderful interview ! I am already in love with her. Will get the book. You are awesome too Gabby ! I also have a passion for astrology. It’s definitely on my purchase list ! I am so glad to hear someone else talk about getting sober and spirituality. I find that because I am practicing my spiritual path, I want to be sober. You are so right. You want to numb yourself less!!! Thanks Gabrielle for this interview. I am going to include this in my new book, “Do As I Say, Not As I Do (Learning To Take My Own Advice). I am on the last chapter and this is just what I need to write about in it!!!! This was such a genuine interview, Loved it! I can relate to this on so many levels. Growing up in a “circus” I was exposed to astrology, witchcraft, spirituality, comparative religion, mental illness and drugs at a very young age. I can definitely understand melding your interests while planting seeds. I am now growing myself as a nursing leader in Scottsdale AZ.